I was going to write about roast chicken. I had it all planned and figured out. I was going to tell you of a glorious weekend on the North Fork, and wine tasting, and meeting Claudia Fleming (swoon). But all this must wait. Because I have to tell you about the chicken I made Monday night for our monthly book club. We ate it up and licked our fingers. Well, I licked my fingers, and I think the other ladies in the book club were better behaved. It’s not often that I find a recipe I like so much that I am thinking about it non-stop and so much so that I would be willing to serve it to my guests again. I’m quite fanatical about not repeating dishes as I try to always cook something new and different and thus maybe have something new to write about, but in this case, really, this will be made over and over and over again. Particularly for dinner parties and more particularly for those dinner parties hosted on a weeknight, when I have roughly an hour and a half to pull dinner together. Because what comes out of your oven is, well, nothing short of stunning. I would even dare say, celestial. I know, I use superlative language here, but if you know me, and I think by now you do, I’m not prone to descriptions that don’t live up to expectation. I’m all about meeting those expectations, folks. And they will be met. Because a slurry of garlic, ginger, apricot jam, soy sauce and the recently written about Sriracha – does something to the chicken that makes it somewhat irresistible. You know it the second you take it out of the oven and smell it that you will be licking your fingers. And the plate, and whatever is left of the sauce. And when your guests go to get seconds and praise your cooking prowess, you might be tempted to tell you that the whole thing took mere minutes to put together. But you won’t. Because you’ll be too busy licking the sauce off your fingers to talk. 1. 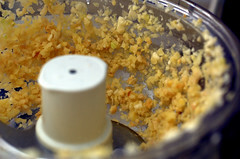 With motor running, drop garlic into a food processor and finely chop. Add ginger and finely chop. 2. 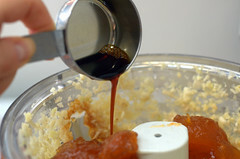 Add preserves, soy sauce, water, and Sriracha and pulse until sauce is combined. 3. Place sauce and chicken in a plastic bag and let marinade for an hour. 5. 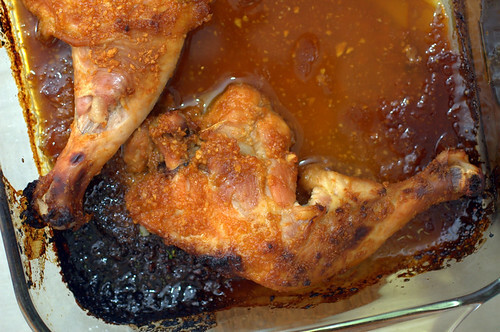 Place the chicken and sauce in a baking pan. 6. Bake at 400F degrees for 30 minutes, at which point, you should check for doneness. If red or pink juices are running (upon cutting into the chicken) cook some more at 350F degrees. I usually check after 15 minutes and then at 5 minute intervals. Ooh, goodness, that sounds lovely. 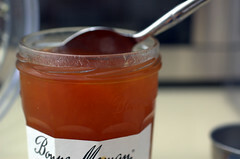 I have something similar with peach preserves and chipotle that I’ve been waiting to make for ages. As one of the book club ladies who ate this, I have to say that it was outstanding!! I would have licked the plate if I had been there alone. i have never quite liked the idea of apricot chicken, it seemed too sweet for a chicken dish, but i am totally digging the sriracha addition! i can imagine the sweetness with the spiciness, the saltiness of the soy, and ginger which i love….mmm, now THAT’S something i could definitely go for. will definitely give this one a try. I’m sold. This is Sunday dinner, no question. Luisa — peach preserves and chipotle – now that sounds stunning! BakingEpiphanies – I agree, I’ve never been a fan of just apricot chicken. I like contrast in my food! Laura – I might make it myself again! Ha. So much for trying something new. This looks great and your photos are always so amazing. I recently made a dish similar to this one, but it was with ribs instead of chicken. You gotta love apricot glazes. That looks so good. I love baked chicken, thighs and legs(they were a weekly stable in my family), my mother always put seasoned salt on them, but this looks so good. Sweet and savory, yummy! I don’t even really eat chicken, but that chicken looks great! I’ll have to try the glaze with tofu or something. 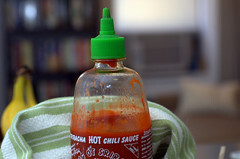 I love Sriracha-it just makes everything so much better! Your description of this dish (and all the reactions it creates) is spot on. I am glad I made this by myself first. I don’t have to share it with anyone, and, in all honesty, my reaction to the flavors and the degree to which I licked my fingers was just inappropriate… And now I want to plan to have people over just to make this. Just made this chicken dish tonight and it was finger licking deliciousness for me and even my chili-wary companion. And so easy to do, took no time at all…yum! It has some elements of a reworked Tagine. It sounds fabulous and will definitely try. this looks wonderful! i will have to make it for my small group. did you serve it with anything else? Rebekah, I served it with a salad, but i can’t remember much – it was awhile ago. This is pretty versatile, you can pair it up with many side dishes. How do you measure a 3 inch piece of ginger. Jackie – i use a ruler or eye-ball it. This sounds divine. I’m planning to make it very soon! I wonder, though, can you let it marinade for more than an hour? Or would that make it too spicy or sweet? I typically prepare my marinades on my lunch hour and prepare once I’m home… this is why I ask. Beth – the longer, the better! Marinade away! very good stuff. Do you have a RSS feed? And also will it be cool if I added your feed to a blog of mine? I have a site which draws content from RSS feeds through a number of websites and I would like to add yours, many people don’t mind since I link back and everything but I like to get approval 1st. Anyway let me know if you could, thanks. Jessika – hi, yes, of course, you can link back. I have an RSS feed and it can be found under “The Basics” on top left. Do you marinate/cook the chicken with the skin on? I’ve been meaning to make this for ages and finally bought the ingredients tonight! AB – yes, I do. I made the glazed sriracha recipe last night it was fantastic! How would you prepare this recipe with skinless boneless chicken breasts instead. Stacy – I’m not a fan of cooking with skinless, boneless chicken breasts because you have WAY less fat to work with and risk getting very dry results. If anything, I’d do skin-on/bone-in chicken breast (you’d have to figure out the cooking time though) and remove the skin prior to eating. The skin protects the meat from drying out – so that would be my recommendation.